What is an unusual attitude? Being angry when you win the Lotto, or happy when you stub your toe doesn’t qualify (although those are some unusual attitudes). An unusual attitude can be any unintended, often times extreme flight attitude, as a result of the pilot being distracted, misunderstanding the aircraft’s attitude, improper control input, or unseen condition (think wake turbulence). Lets’ see if we can break that down into something more concrete. Over-banked, stalled, spun, inverted, over-pitched, and any combination of these would qualify as unusual attitudes. I’ll leave the discussion on stalls and spins to the Spin page on this web, although those qualify as unusual attitudes or upset conditions. Our unusual attitude discussions here are confined to over-banked, over-pitched (nose up and down, in reference to the earth), including inverted flight conditions and combinations of these. Whether you fly airplanes certified in the Normal category (+3.8/-1.52 g’s), Utility (+4.4/-1.76 g’s), or Acrobatic (+6.0/-3.0 g’s) we need to extricate ourselves and our airplanes from unusual attitudes in a manner that will not exceed that category’s design load limits. 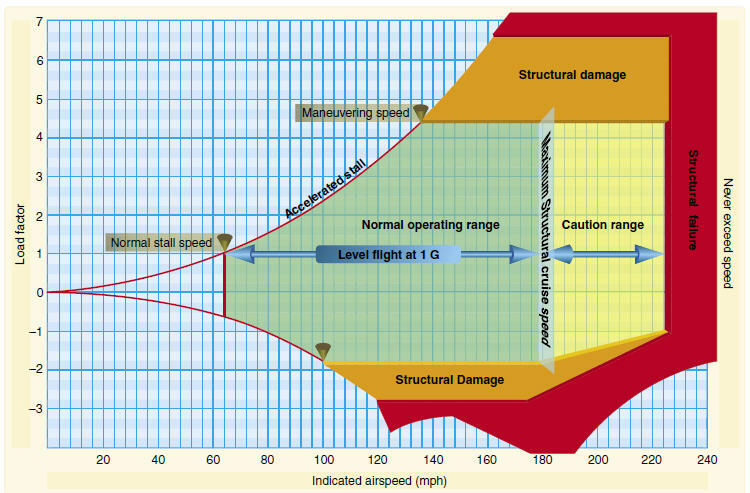 Using the velocity-g load (V-g) diagram (below, excerpted from the FAA Pilot’s Handbook of Aeronautical Knowledge), we can see where we need to remain to prevent airframe damage or failure (the diagram depicts the Utility category). What causes airplanes to exceed design load limits? Inappropriate control inputs: Specifically, our hard-wired instinct to “pull” elevator and our failure to roll to wings level (or our rolling the wings to level flight while we pull). Exceeding the never exceed speed (Vne) can also break airplanes. Combining these two is a surefire formula for ruining your day. Here’s what pulling does for us: It increases the load factor and increases the angle of attack. One typically gets us closer to the positive design load limit, very bad; and the other gets us closer to an aerodynamic stall (the area above “accelerated stall” on the V-g diagram), also bad. Here’s what failing to roll wings level does for us: In conjunction with a high speed pull-out, non-level flight reduces the airplane’s ability to reach its design load limit before structural damage or failure occurs (that normal operating range in the V-g diagram is markedly different with un-level wings). And rolling the wings while pulling from a dive, referred to as rolling g's, can cause a twisting moment to the wings. Very bad. Alright, that’s the bad stuff and what not to do. Here’s what you should do. In cruise flight in one or more of these unusual attitudes, reduce power first, push the elevator to “unload” the wing, decreasing the load factor, decreasing the angle of attack, and robbing the airplane of its earth-bound trajectory. Immediately roll the wings level. If in the traffic pattern, or otherwise close to the ground, where you’re low, slow, and aerodynamically dirty, add power (full power; don’t be shy). Like during stall recovery, adding power reduces altitude loss. Our recovery process is: Full power, push elevator, roll wings level. Our non-Acrobatic category airplanes will have anemic roll rates, so don’t be shy with roll input: All the way to the stop. If you’re up close and personal with wake turbulence, you have to make a quick decision on which way to roll; rolling in the direction of your roll excursion may take advantage of the wake vortex to complete the roll to upright flight. At best, this low altitude recovery is difficult with quick, correct control inputs as we have little room for maneuvering. It's one of the reasons why we need to practice this. It has to be second nature. “Chair fly” these scenarios during a quiet moment, hangar fly them, in the cockpit before flight, whenever you can. Fly these scenarios in an aerobatic airplane at altitude with a qualified instructor. Build the confidence you need to deal with unusual attitudes so your response is second nature. A requirement of the Bachelor of Science in Aviation Science degree I received from Utah Valley University included a Capstone Research Project. 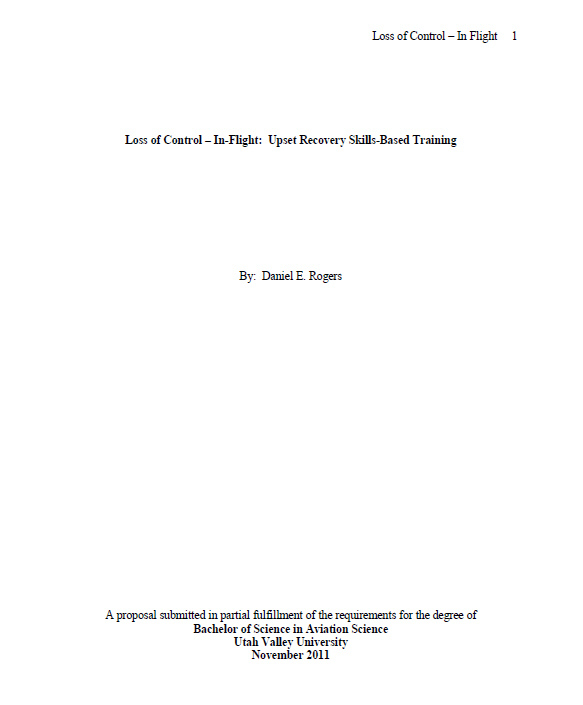 The paper I wrote for this class is a discussion of loss of control - in-flight (LOC-I), the number one causal factor in fatal general aviation and commercial aviation accidents in the United States. Download the file and take some time to read through it (excellent medicine if you're an insomniac). Here's a syllabus for my unusual attitude training instruction. Copyright (c) 2017 Aero Enterprises LLC All rights reserved.